Release 79.18 ships with a brand new storage tracking module. Storage tracking module is responsible for maintaining detailed list of storage devices, file system volumes and drives. The backup engine uses this information for tracking removable drives, running backups in response to drive arrivals, adapting bulk IO profile to the device specifics and for several other tasks. In earlier releases volume information was queried in an ad-hoc fashion, when it was needed or when it became stale. This release gathers all this functionality in a single place, adds support for tracking device information and improves detection of changes to network drives. It also reworks processing of Windows device notifications, which are the "pings" sent by the OS when devices arrive or depart, volumes get mounted, locked, formatted, renamed, etc. The program is now capable of sourcing these notifications from more than one place, which gives it a fallback option should the default notification source stop working ... at least until you get to reboot that WS2012 instance. 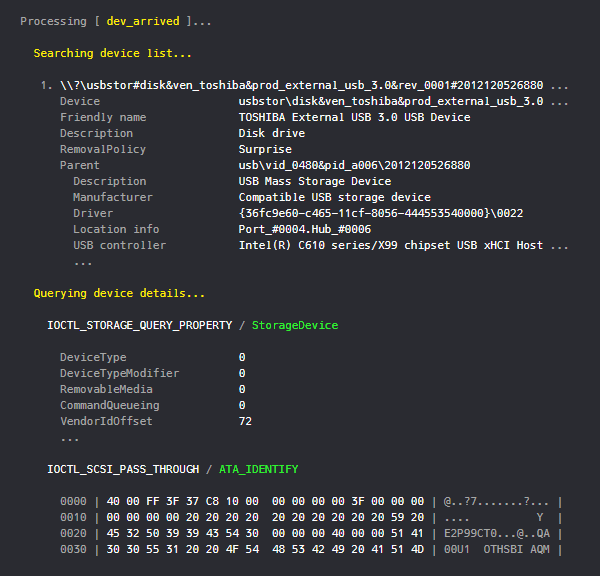 Storage tracking module includes explicit support for TrueCrypt volumes. This is notable because TrueCrypt does not implement all required volume notifications, making it impossible to track volume activity via standard means. For example, a system service will never receive any alerts for TC volumes being mounted or unmounted. These quirks are transparently accommodated. It all just works as expected. New code comes from Diskovery, a storage inspection tool that we first released back in 2016 and have been steadily improving ever since. In fact, the plan has always been to use Diskovery as a testbed for all things storage-related and then fold them into Bvckup 2. And so we are now at exactly that point - all hard-earned Diskovery smarts are now being merged into Bvckup 2. First, with this release the program gets access to raw device information, which is vastly more detailed and accurate than what's available through conventional Windows APIs. Next, we'll be enabling the monitoring of device SMART status and tracking of SMART attributes. The code that supports this is ready to go, it's now only a matter of pacing the merge through its stages. We are also on track for adding previously announced UI support for the storage monitor to the next major release, R80.